Who are you? Are you Sonic or Shadow? Nazo's introduction, in which he nonchalantly steals a Chaos Emerald and wipes out a city. Sonic proves he's the fastest thing alive for a reason. Nazo's blasts can't hit him. Tails and Knuckles are woefully outmatched, but they still fight back against Nazo to protect Sonic. Nazo wiping out Tails in one blast. Again, this is Tails we're talking about here, a series mainstay and known Badass Adorable. Nazo doesn't even break a sweat eliminating him. Shadow's introduction. The haughty attitude and badassery of Vegeta, in hedgehog form. Shadow arriving doesn't even faze Nazo. He just sends him flying with one blow. Sonic goes Super for the first time in the story— but since he uses the Negative energy of the Chaos Emeralds, he ends up being Dark Super Sonic. Nazo seems rather intimidated. Another moment for Nazo. According to Word of God, all Dark Super Sonic could do would be smack Nazo around, as they're both made of Negative Chaos energy. Sonic goes Super again, and dishes out a well-deserved beatdown to Nazo, culminating in the two clashing in the skies in a beautifully-animated fight sequence. Shadow getting right back up and going Super is a moment unto itself, but the real awesomeness comes when Shadow and Sonic, each in their Super Forms, viciously attack Nazo with Lightspeed Attack, in a massive Curb-Stomp Battle. The reveal of Perfect Nazo. His sheer power is incredible. Between delivering a firm No-Sell to everything tried on him, and managing to overpower Chaos Control, his introduction is utterly incredible. Even the Super Forms don't pose a threat against him. Shadow performing a Chaos Blast in Super Form would be one, except Perfect Nazo ignores it. The Super Emeralds appearing. Anyone aware of what comes next knows this is incredible. 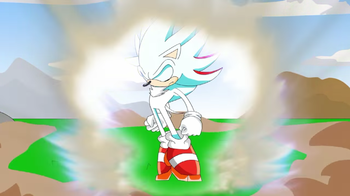 And, of course, the most iconic moment in Nazo Unleashed, Hyper Shadic's arrival. Not only are the Hyper Forms unexpected, but then the two use Chaos Control to fuse into Hyper Shadic, who delivers a beautifully-drawn beatdown of Perfect Nazo, culminating in them battling in the Earth's orbit. When the dust settles, Shadow and Sonic have won.